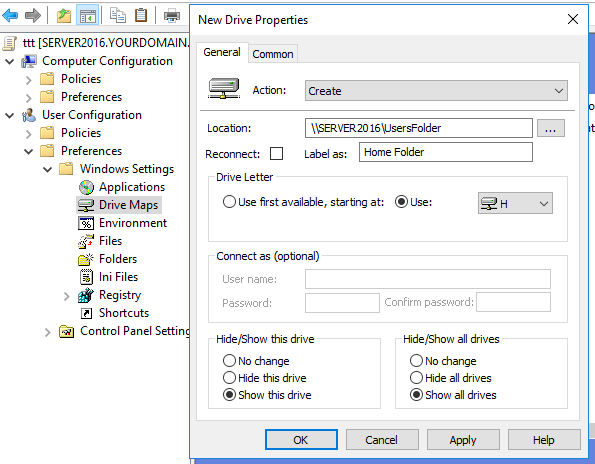 There are two methods for mapping a shared folder to a network drive (using GUI and group policy). I am focusing on the later method of using a group policy. I assume you have already shared a folder with right permissions. You can check my recent article on setting correct permissions for a shared folder. Step 1: Open the group policy management console. Step 2: Right-click on your domain or any specific users OU for which you want to map the network drive. Step 3: Click "Create a GPO in this domain, and Link it here". Step 4: Give a meaningful name to the GPO. Step 5: Right-click on the newly created GPO and choose Edit. Step 6: Go to the following location. Step 7: Right-click on Drive Maps and then click New -> Mapped Drive. Step 8: On the General tab, choose 'Create' from the action drop down. Step 9: Provide the shared folder location, check the Reconnect checkbox, and give a meaningful label as well as a drive letter. Step 10: Go to common tab, and choose Run in logged-on user's security context option. Step 11: Open the command prompt and execute the gpupdate command to update the group policies.